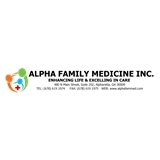 Alpha Family Medicine (Alpharetta) - Book Appointment Online! Nice lady! Very kind, compassionate and detailed with her work. Would see her again. Dr. Lee was really great! Love Dr. Reddy! I started going to her early 2015 when she was new and it was great and even now that your practice has picked up more patients I still love it! I'm still able to do same day appts if I need to or just make an appointment. She is very invested in her patients! I highly recommend her. I'm in Duluth and I have no problem making the trip to her office. Well worth it!